Splash pages - you gotta love 'em. A place where the penciller can hit the reader full-throttle, with a large dose of illustrated 'wow'. This week, with Darkseid's presence re-emerging in the latest issues of Legion of Super-Heroes, I thought it was time to chuck up this wee beauty from the seminal Great Darkness Saga, by artist Keith Giffen. 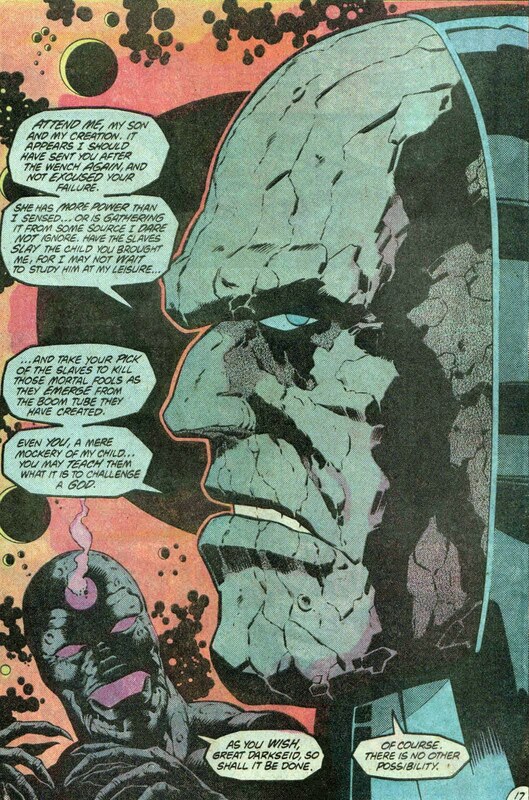 With Giffen having few who can match his talent for facial expressions, Darkseid, all arrogant and smug, sneers at the reader as he orders the execution of those who oppose him. Like he's not even worried who hears his plan - he's so assured of its success. The other thing that makes the whole thing pop - those 'Kirby' dots! Nothing says 'comics' like Kirby-dots, yet they are all too absent from today's books (or the ones I grab at least!). Darkside and Dr. Doom are the Darth Vaders of DC and Marvel. what higher praise can there be then that?